A very important report released by the United Nations Foundation, the International Centre for Trade and Sustainable Development (ICTSD) and the Energy and Security Group finds that bioenergy can provide significant economic and environmental opportunities for rural areas in West Africa, where 70% of the region's poor make a living. The report, "Sustainable Bioenergy in UEMOA Member Countries", released at FAO Headquarters in Rome, finds that donor and host country investments in bioenergy can reduce the exposure of West African countries to high food and oil prices and open up new economic opportunities in clean energy development. 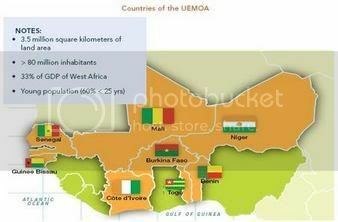 Biomass can also expand agricultural production across the UEMOA (the Economic and Monetary Union of West Africa) nations of Benin, Burkina-Faso, Cote d’Ivoire, Guinea Bissau, Mali, Niger, Senegal and Togo (map, click to enlarge) which have been hit hard by the food crisis and rising oil prices. Sound bioenergy production policies can help drive a coordinated approach to poverty reduction and reduce the impact of climate change on these already vulnerable areas. This report takes on the twin challenges of energy and agriculture and explores how bioenergy crops and modern uses of biomass in rural areas of West Africa could play a role in alleviating poverty while protecting food production. It is vital that policies and technologies are developed and implemented to better use agricultural and forest residues. If used correctly, these energy feedstocks hold great potential for efficient and affordable locally-produced fuels and this can be done in a sustainable and responsible way that ensures the world’s most vulnerable populations have access to clean fuels and are not put at further risk. - Melinda Kimble, Senior Vice President with the UN Foundation. Commissioned by UEMOA and the Rural Hub for Western and Central Africa, a key regional NGO promoting rural poverty alleviation, the report finds that these oil-import dependent countries possess enough arable land (table 1, click to enlarge) and forests to cultivate sufficient foodstocks and harvest biomass to produce expanded amounts of bioenergy. But less than two percent of these arable acres are irrigated, leaving them vulnerable to erratic weather patterns. The report concludes that greater investment in irrigation, as well as fertilizer and farm equipment are all needed if agricultural yields are to increase in line with a growing population. Better yields are essential in order to improve standards of living in UEMOA countries, since roughly 70% of the population depends on agricultural or forestry-related jobs (table 2, click to enlarge). Conversely, only seven percent of the rural population has access to electricity, greatly limiting economic growth, the report finds. According to the report, key factors to guide sustainable bioenergy include improving agriculture and forest productivity, and protecting watersheds, which would also put governments in a better position to fight against climate change and cope with inevitable impacts. Traditional wood biomass production – 73% of primary energy used in the region – must be adapted to create more efficient and cleaner fuel. Innovative crop management, farmer training, and consistent investment are needed to improve agriculture productivity in this region. Land use, protection of small producers, infrastructure improvement, data collection, and women’s roles are some of the critical points which must be taken into account by governments in order to secure sustainability, the report found. The United Nations Foundation is an advocate for the UN and a platform for connecting people, ideas and capital to help the United Nations solve global problems. We build partnerships, grow constituencies, mobilize resources and advocate policy changes to support the UN’s work for individual and global progress. The UN Foundation’s work — focused on select global problems — is decreasing child mortality, improving disaster relief, protecting diverse cultures and environments, creating a clean energy future, empowering women and girls, and improving U.S.-UN relations. The UN Foundation is a public charity. The International Centre for Trade and Sustainable Development (ICTSD) was established in Geneva in September 1996 to contribute to a better understanding of development and environment concerns in the context of international trade. As an independent non-profit and non-governmental organisation, ICTSD engages a broad range of actors in ongoing dialogue about trade and sustainable development. With a wide network of governmental, non-governmental and inter-governmental partners, ICTSD plays a unique systemic role as a provider of original, non-partisan reporting and facilitation services at the intersection of international trade and sustainable development. The Rural Hub for Western and Central Africa is a non-governmental organization whose goal is to assist West and Central African stakeholders (States, Inter-governmental Organisations, Civil Society Organisations and Development Partners) to promote coherence in rural development programmes worldwide. 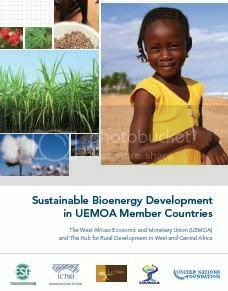 UN Foundation: Sustainable Bioenergy Development in UEMOA Member Countries - October 2008 [separate chapters in *.pdf format - full report in one *.pdf file, here]. I think more biogas plants should be installed to help with the human and agricultural waste in the areas where drinking water is compromised.